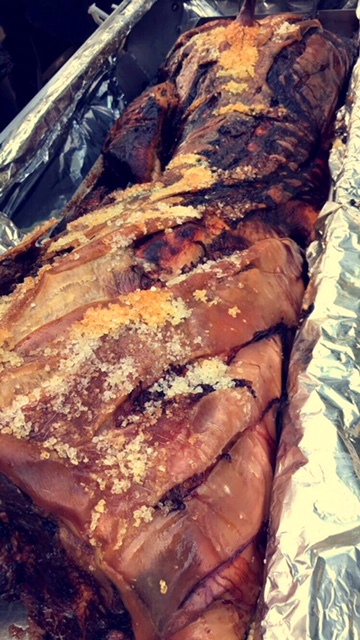 Our Taste The Cracklin team have been enjoying the lovely summer weather with our customers, whether catering for events and parties both locally and further away, or when hiring out our own hog roast machines. We cater to both professional and domestic chefs with our machine rental service and we have a range of equipment to suit all kinds of needs. Summertime in this country always means more barbecuing and meat roasting outdoors, though if you’re thinking of cooking your own indoors, you can with our equipment, as long as there’s good ventilation and plenty of space. Just recently, a new customer, Pete, enquired with Taste The Cracklin about renting one of our hog roast machines so that he could cook his first ever hog roast for a family party. It can seem daunting but our machines are easy to use and with our wealth of knowledge and years of experience, we can help you on the road to hog roasting success. Pete loves to barbecue and often cooks burgers and sausages in the summer months but wanted to try a hog roast in his back garden, so we talked to him about our range of equipment and the ins and outs of preparing and cooking this kind of meat. We assured him that he would find it much easier than he might have thought prior and then booked him in for us to deliver the machine at the weekend. Delivery and collection is a part of our machine hire service and we can even bring along the meat if you’re not sure where to source it. We’ve used some excellent suppliers for many years now and they supply the best quality pigs that cook beautifully using one of our range. On the day that Pete needed the machine delivered to his home address, we also provided him with a small free-range hog, which would feed his guests and give plenty of seconds or more, too. We walked him through using the machine and preparing the meat and then left him to his own devices, with instructions just in case. When Taste The Cracklin collected the machine from Pete, his first hog roast had been a resounding success and he is now hooked on this fantastic style of cooking.